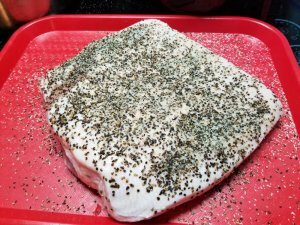 Got a 4 pound skinned pork belly at HEB yesterday. This morning I rubbed it down with 1/2 salt and 1/2 pepper, then placed it in the 40" Masterbuilt gasser/smoker. 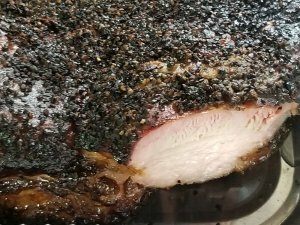 Wrapped in pink butcher paper after 4 hours, cooked for 2 hours more, then another hour unwrapped. 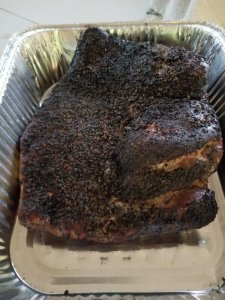 Pulled it at 200 internal temp. Fat rendered very well, melts in your mouth, lean meat very tender. That looks great Rex ! I love Pork Belly ! May I throw a suggestion out there ? 3 cheers for pork goodness!! Hip hip hooray!!! Hip hip hooray!! Hip hip hooray!! I've never smoked but have done in the oven. Was really melt in your mouth stuff. I have some in the freezer ATM. I love pork belly tacos!! Pork belly is a real treat.